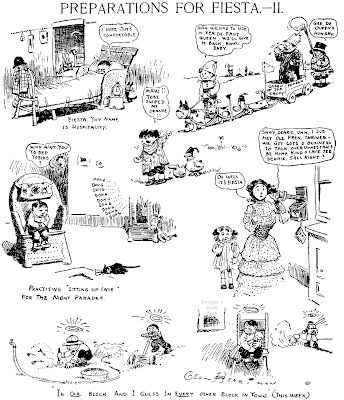 Still recovering from our trip to the Library of Congress, and today I've volunteered to go out canvassing for the Obama campaign, so just one Herriman cartoon this week. This is the second of his series on the Shriners' convention, printed May 3, 1907. By the way I'll be talking more about our LoC trip come Monday, but wanted to get back to our regular weekend features since we missed one weekend already. Got back from the Library of Congress Wednesday night, then spent all day Thursday typing in the newfound information into my Stripper's Guide database. Following is a quick summary of our new information. Please note that a lot of the information we were seeking was based on tips we got right here on the blog, and I thank all of you who have been providing suggestions for places to search -- we had great luck with your suggestions! * Local strip Rollicking Realms of Boreas found. * Lots of local strips in the Newark Evening News of the 20s documented, including one predecessor of Al Jaffee's Mad magazine Fold-In feature. * Couldn't find anything out about You Know How It Is, self-syndicated feature. * Correct start date for Zippy The Pinhead, four months later than Griffy claims on his website. * Start date for Mr. Straphanger -- LoC missing too much Detroit News microfilm to determine end date. * Determined that W.C. Fields strip did not run in its home paper, the LA Times. * Determined that Out Of Orbit and Out Of This World were both ROP features in Dallas Morning News so gave up trying to track them on this visit. * Pushed back start date on Funny Signs but ran out of time looking for start date. * Corrected dates on Mazie The Motor Maid that previously came from a secondary paper running it. * End date for Angelina's Line A Day; ran out of time before finding start date. * Pushed back the daily end date of Tailspin Tommy by a week. * Got a start date for Buffalo Burt, ran out of time to find the end date. * Found the ROP Countdown running a year later than previously known. * SF Chronicle either did not run Bizarro from the beginning as cited in a press release as January 1985 or the press release is bogus. * Now Society which ended its daily run in 1979 was found running in a 1985 SF Chronicle Sunday -- just a sporadic occurrence? No time to check. * On Sale Today found still running in 1989 but since paper used it only once a week didn't pursue an end date. * End date for Cleveland found. * Sonny Pew started in 1981, not 1982; no time to check further in Cleveland Press. * Determined that Danny Dumm was actually a strip adjunct to a daily sports editorial cartoon in the Cincinnati Enquirer. * Could find no sign of Chicago Latino in the Chicago Today paper in 1972. Came home to find that my samples have disappeared from my files. Now THAT'S a mystery strip! * Start date for Swan Factory -- another Deseret News tryout. * Bumped end date of Top Of The World out by about 3 months. * End date of Blast Blair bumped out 5 months. * Got running dates for X-Rays. * Checked August 1974-February 1975 Corpus Christi Caller for Friends and Romans that was supposedly running as a local strip then -- didn't find it. * got start date for Intellectual Pup, searched as late as 1942, still running. * New weekly panel They Never Grow Old local in Boston Post, no time to track down start and end dates. * End date on Boston Post's Nip And Tuck; no time to get start date. * Fixed some dates for the NY American's strips in 1916-1917, but the microfilm is in such disarray and so much is missing that I didn't get very far. * Went through the film of the New York Evening Journal for 1919 and 1921-1924 in order to clean up a lot of listings with missing info, found some new stuff too. * Found 3 months of the full four page World Color Printing section in March-May 1904; although Jeffrey Lindenblatt had already found 5 months from January-May in the NY Daily News his findings there were so odd (cartoonists that never worked for WCP as far as I knew) that I figured he had to have found a combination of multiple syndicates. The three months I found in the Boston Journal, however, reconfirm his data perfectly, so we now have the full four page section all through the first half of 1904! I have page B1 from the August 31, 1974 Corpus Christi Caller which features a big article on Isbell and his strip. That article states that Friends and Romans "will debut Monday in the Caller". Another item from the Caller, this one undated, announcing the suspension of the strip pending national syndication says that the strip "has been appearing six days a week in the Caller since Sept. 2". The March 8, 1975 issue of Editor and Publisher announcing the March 30, 1975 beginning date for syndication of the strip reads "Continental Features, Inc., of Atlanta took on syndication of the humor strip after it had been running about three weeks in the Corpus Christi Caller-Times." I haven't found it, as a local strip, in the few issues of the evening Times of that period, and I don't have access to the morning Caller of September 1974; but I got to believe it is in there and you have overlooked it. I thank Isbell relatives Al and Jerry, cousin and uncle respectively, for the Caller articles, and for so much more about Tom Isbell (a cousin, on his mother's side to Farrah Fawcett; maybe not a big deal now, but during the run of the strip...). the latest I can find is January 2, 1978 - do you have an end date for that strip? Thanks for asking, and sorry about the jargon. ROP stands for Run Of Press and when used to describe a newspaper feature, whether a strip, a panel, or most anything else, it means that the feature is essentially put aside to fill a hole when doing the makeup of the paper. Thus the feature can appear most anywhere in a given day's issue, or not appear at all if there was no need to fill a hole. Panel cartoons are often used as ROPs and when used that way there is little point in trying to track them for indexing purposes because they are often run out of order and days, weeks, or even months away from their intended publication dates. I have an original drawing at the Library of Congress for Friends and Romans, copyright United Feature Syndicate, 1977, published January 2, 1977, in the Art Wood Collection.